The Dane County Farmer’s Market will be open, so swing by the farmer’s market and stop in the public market for a day of Madison’s best food and crafts! 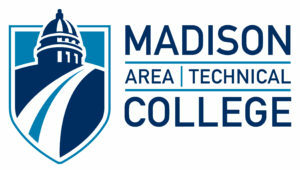 Plenty of parking is available at the City ramp directly across the street from Madison College. For more information, contact info@madisonpublicmarket.org. Thank you to our awesome sponsors! Previous blogs on this page have described the activities of the MarketReady Program. Sponsored by the City of Madison and administered by the Northside Planning Council on behalf of the Madison Public Market, MarketReady provides training, supportive services and micro-grants for entrepreneurs interested in becoming Market vendors. Program recipients are typically individuals from groups facing historic barriers to entrepreneurship, including low income, immigrants, women, displaced workers, veterans and LGBTQ individuals. MarketReady staff provide hours of individual and group-based guidance, mentorship and other hands-on support to the new business owners. Many are becoming successful beyond their dreams, and the local media is taking notice. During the last month or so, MarketReady vendors were featured in print, online, on television, and in podcasts. Kristina Abasso and her Abasso Market Deli venture was featured in the Capital Times Bright Ideas of 2018 series. The article Bright Ideas 2018: Open a vegan Native American deli describes her public market plans for a plant-based deli featuring tribal sourced ingredients. Donale Richards was also featured in the same series. Bright Ideas 2018: Listen to kids, especially those facing barriers describes his upbringing in Madison as well as his journey through UW and current role with Mentoring Positives. This organization is the driving force behind Off the Block Salsa, a local favorite and potential Public Market vendor. SuperCharge! Foods, located across First Street from the proposed Madison Public Market site, was written up on the Capital Times front page and featured in a podcast. Read about their success in The Big Squeeze: Madison juice bars get in on cleansing kick. The Corner Table podcast with Jamaal Strickland, SuperCharge! sales director, is also a fun listen. SuperCharge! Foods is now providing goods to a juice bar vendor in the Milwaukee Public Market. This will help them get a sense for future demand at the Madison Public Market. Jasmine Banks and her Perfect Imperfections body care products company was the subject of the Isthmus article Perfect Imperfections presents a healthy alternative in body care. The current product line includes deodorant, lip balm, body oil, natural scrubs whipped body butter and more. Monica O’Connell of Curtis & Cake takes the cake with a double whammy in media attention. Her wedding cakes were showcased in Brava Magazine and she also enjoyed a Wisconsin Life feature video produced by Wisconsin Public Television. Please reach out to these and other MarketReady participants to wish them well. Even if they have not received media attention recently, they deserve your encouragement and support. Holiday Taste of the Madison Public Market draws over 400 attendees! 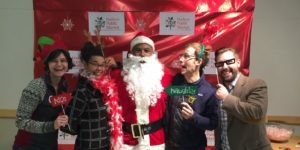 Earlier this month, the Madison Public Market Foundation hosted the Madison Public Market Holiday Magic celebration, which drew over 400 people. 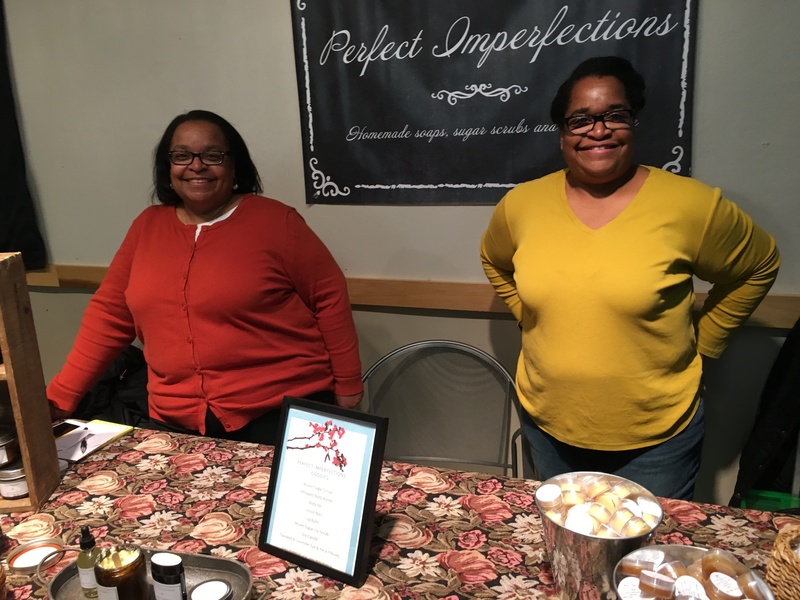 Attendees were regaled with edible, wearable, sniff-able and show-off- able wares, made by vendors with a particular interest in the proposed Madison Public Market. A highlight of the evening was a chance for a photo with that bearded wonder, Santa Claus (also known as Mike Miller!) Held at Curt Brink’s vacant, eclectic space at 945 East Washington Avenue, the event was not far from the proposed location of the permanent Public Market at First & East Washington Ave. The Holiday Magic event was the second Market preview event this year, with the first Taste of the Madison Public Market event drawing over 700 people in early October. Both provided attendees with a taste, literally, of what will be experienced at our Public Market. The vision is for the Madison Public Market to become a significant economic driver, jump starting local food and handmade goods businesses, specifically in multicultural communities. Early-stage businesses will flourish in the Public Market through a built-in customer base, affordable rents, and support services. The market will also create opportunities for established food-based businesses. Building on Madison’s existing strengths and competitive advantages in the food industry, the market will help drive the growth of our local food economy. The Public Market Holiday Celebration showcased those small businesses selected as MarketReady Program participants. The Madison Public Market’s MarketReady Program is an initiative sponsored by the City of Madison to provide training and micro-grants for new and existing small business entrepreneurs from diverse backgrounds who are interested in becoming Madison Public Market vendors. The City of Madison Economic Development Department, in association with the volunteer-staffed Public Market Development Committee, are currently in negotiation with a local development group to build out the Madison Public Market space at the First Street and East Washington Avenue. With the Public Market as the highlighted feature, this public/private partnership will also add 2 towers of apartment units, office space, and restaurant/retail space to the property. Our Public Market is still on-track for a late 2019 opening. A huge thank you to Curt Brink for the use of his space at 945 and to Gorilla Movers of Wisconsin for sponsoring the event and saving us hundreds of dollars on moving tables! To stay updated on Public Market events and happenings, join us on Facebook or our monthly e-Update list. 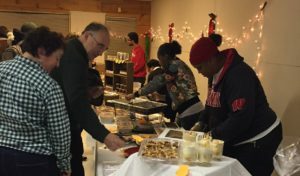 Posted in UncategorizedLeave a Comment on Holiday Taste of the Madison Public Market draws over 400 attendees! Looking for something special for that special someone this holiday season? Tired of seeing Amazon and WalMart gobble up the local business economy, leaving empty storefronts across Main Street America? Perhaps your best bet is to support your friends and neighbors by buying local on Small Business Saturday, this November 25th. Specialty body care products, children’s books, one-of-a kind arts and crafts, hand-made clothing and even treats for that furry, four-footed friend are readily available from a locally-owned or managed small business. These storefronts line State Street, Willy Street, Monroe Street, downtown Verona, Stoughton, Mount Horeb and communities throughout the region. You can find many of these vendors at #ShineOnMadison and #DaneBuyLocal. The right “Oh, my gosh!” gift is probably just down the street. Small Business Saturday started in 2010 and has grown across the country to include shoppers like you and local businesses everywhere. In 2016, 112 million shoppers showed their support for local merchants, and spent a reported $15.4 billion. 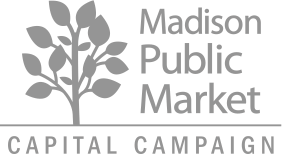 The Madison Public Market is working to support local entrepreneurs in association with the MarketReady Program. The training program provides business training services and micro-grants to low income populations, people of color and other populations that face historic barriers to starting businesses, including displaced workers, women, veterans and immigrants. Many of the vendors accepted into the program are interested in becoming regular vendors at the Public Market. In fact, a number of MarketReady merchants have holiday items ranging from delicious cakes to beautiful gift items. And if other plans get in your way and you can’t do your holiday shopping on Small Business Saturday, come on down to the next Taste of the Public Market event on December 6. Join us to experience some of the magic of the holiday season with the merchants and makers of your Public Market. Explore the traditions and customs of Madison’s many cultures through tasty treats and gifts for your loved ones. See you out and about, supporting your local businesses! After the success of our Taste of the Public Market event in October, many folks have asked us for more Public Market events. We hear you! We’re planning more Taste of the Madison Public Market events for 2018. Each Taste event will have a different theme to give you sampling of what the Public Market will offer. Our next Taste event is coming up on December 6. Join us to experience some of the magic of the holiday season with the merchants and makers of your Public Market. Explore the traditions and customs of Madison’s many cultures through tasty treats and gifts for your loved ones. Join your friends and neighbors in celebrating the holidays at this free event. To honor this season of merriment, Taste of the Public Market – Holiday Magic! will feature performances by Madison musicians. There will be activities for the kids, and even a visit from a certain gentleman who dresses in red! Market Hall: Sample the delicious and unique foods of Madison, and wrap up your Holiday shopping with locally handcrafted artisans. Children’s Area: Seasonal activities and a certain “jolly old elf” will entertain and delight the little ones. Live Music and Performances: Featuring performances by Madison-area musicians from many different traditions and cultures. Sure to get you tapping toes, humming along, and into the Holiday Spirit. The Holidays are a time for togetherness. So grab a friend, a colleague, or a neighbor to learn about and support Madison’s next hub for all things local. Like our Facebook event to stay updated on event details. The event location is near the corner of Brearly & E. Wash next to the Credit Union. Parking is available in the lot behind the building. Enter from the backdoor entrance off the parking lot. A huge thank you to Gorilla Movers for moving all the tables needed for our event. They saved us hundreds of dollars! Focus on entrepreneurial opportunities within communities that are typically left out of the business start-up conversation. Bring more local food to large institutions across the region through the Market’s Food Innovation Center. Create a truly multi-cultural community gathering place that is alive with social and economic activity. Please keep the full Public Market funding of $7.5 million in the 2018 capital budget. If the size of the crowd and the energy apparent is any indication, the proposed Madison Public Market will be a grand success. At the October 11 “A Taste of the Madison Public Market” preview event, the more than 600 people in attendance indulged in the incredible food and learned about some of the Market’s proposed offerings. Twenty-some vendors, many who have been accepted into the MarketReady Program, offered samples of their culinary creations or sold hand crafted jewelry, clothing, decorative magnets and even pet treats. MarketReady is focused on providing training, supportive services and micro-grants for entrepreneurs interested in becoming Madison Public Market vendors. This group of new and accelerating business owners included Curtis & Cake, Perfect Imperfections, Yerba Madre, QB’s Magnetic Creations, Off the Block Salsa, Artesan Fruit, dZi Little Tibet Mobile Cuisine, Madame Chu, Ugly Apple, Libros for Kids, Books for Niños, and SuperCharge! Foods. More established companies with an interest in a presence at the Market were also there, offering samples of their wares and products for sale. Included were Chocolate Shoppe, Slide Food Cart and Beyond Catering, Rushing Waters Fisheries, Grasshopper Goods and American Skillet Company, Mad Urban Bees, Cafe Social, Just Coffee!, and Aaron Laux Design. Also on display was a demonstration area of the Food Innovation Center. The Center consists of 15,000 sq. feet of the overall Market and will play a significant role in increasing local food production, ultimately increasing local food options at schools, hospitals, and restaurants across our region. Thanks to our partner FEED Kitchens for managing the demonstration area. Music was provided by DJ 40 Roundz through a sponsorship from Dane Dances. This was only a slight representation of the music, culture and art experiences planned for both the indoor and outdoor spaces at the completed market. Amanda White, a fundraising consultant to the Madison Public Market project gave an update regarding the Market’s progress to date, sharing site plans and preliminary architectural concepts. She encouraged donations to be made to the Public Market project. We hope you might also consider supporting the market in this way. The Madison Public Market is on track to be built in 2019 on the First Street and East Washington Avenue site. To learn more about the market and its ongoing progress visit the City of Madison’s Public Market page. To get a sense of the Market’s potential and flavor, visit the Madison Public Market website. We are also on Facebook. If you are interested in showcasing your business at a future Public Market event, mail us at info@madisonpublicmarket.org and give us your contact info, name of your business, and a brief description. We’ll put you on the list for consideration for a future event. Get a Taste of the Madison Public Market on October 11! The merchants are the heart of our Public Market. With the selection of diverse MarketReady entrepreneurs, we are so close to making our Public Market a reality. The Market will not only foster an ecosystem for accelerating local businesses, but it will also be a unique community gathering place where we honor the different customs and history of Madison’s many cultures through art, storytelling, and delicious food. Stop by Taste of the Madison Public Market event to meet several of the MarketReady entrepreneurs and enjoy a sampling of the many activities and experiences that will be available at our vibrant, community-based Public Market. Children’s Area: Story-telling children’s activity by Araceli Exparza who is a MarketReady entrepreneur and plans to open a children’s bookstore that carries bilingual books and local authors inside the Market. Food Innovation Center: Exhibit displaying what the Center will offer and how it will significantly increase local food in our community. Thanks to our friends at FEED Kitchens for sponsoring this space at the event. Our Public Market is sure to be Madison’s next treasured community space. Be one of the first to experience this amazing project and learn more about the details. RSVP is appreciated for our Merchants to approximate quantities, but not required. Posted in UncategorizedLeave a Comment on Get a Taste of the Madison Public Market on October 11! Have you ever wondered if places like your favorite local restaurant, your kid’s school, or your employer’s cafeteria provide local food? 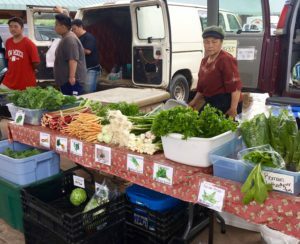 The demand for more local produce and food products has been on the rise, but larger institutions have had difficulty securing enough local food options to meet the demand. An important goal of the Madison Public Market is not only to bring local food to those who visit, but also to help increase the food available throughout our region. Approximately 15,000 square feet of the Public Market will be dedicated to the Food Innovation Center, a local food production, wholesale and workforce training facility that will be a catalyst in driving Madison’s growing food economy to its full potential. Madisonians want more local food options, so what’s the problem? Storage and production space: Local food producers are constantly searching for affordable spaces to produce and store their food products. A simple, yet severe, lack of space is limiting the volume of local produce and products available to large institutions. Limited distribution system: Once more food can be produced, growers and producers must have a way to transport the food to institutions. The current model of growers/producers attempting to work individually with many large institution customers is inefficient and impractical. A skilled workforce: As our 21st century food system modernizes and concentrates more on the local food economy, our workforce must adapt to meet the change. Greatly needed production space to increase the volume of local food produce and products available for large institutional buyers. For example, the Madison Metropolitan School District currently purchases thousands of pounds of local produce for school meals, which need to be processed out-of-state due to lack of local production options. Space at the Food Innovation Center can fill this gap. A more efficient distribution system that will enable large institution buyers to purchase from one source instead of trying to manage contracts with 20-40 different local food providers. Making it easier for large institutions to purchase goods will increase the options available. 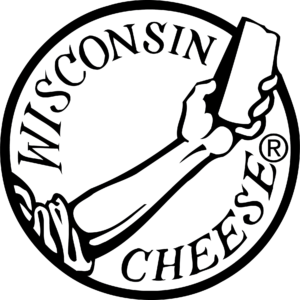 Workforce Training programs – As our food system evolves and grows, Madison faces an acute need for skilled workers in our food preparation and processing sectors. The Food Innovation Center will include space for workforce training programs focused on helping people become job-ready for positions in this growing industry. These programs will be provided by community partners including FoodWorks – a private sector collaboration between well-known Madison chefs and business owners focused on training unemployed and underemployed adults for positions in the culinary industry. The Public Market team is continuing to finalize details of the Food Innovation Center design and programming. Between the Public Market Development Committee and the Public Market Advisory Council, the project is fortunate to be drawing on the expertise of key local food business leaders and food system experts to plan and design the Food Innovation Center. This includes involvement from the Underground Food Collective, REAP Food Group, FEED Kitchens, the UW Center for Integrated Agriculture Systems, Fairshare CSA Coalition, several food business owners, and others. Working together, we will build a 21st century food system for future generations that is more sustainable, equitable, fruitful, and healthy. No matter how often you visit the Public Market, the Food Innovation Center will bring more delicious local food options to your everyday life. Through the years, the Madison Public Market concept has gone through many changes. But one important, guiding principle has remained strong: ensure that the Market is a truly inclusive, welcoming place of community for all who reside and visit Madison. From the City of Madison, to the Friends of the Public Market group, to the newly created Madison Public Market Foundation, all supporters working on this project agree that inclusivity begins by ensuring that merchant opportunities are available to any person with a dream of starting their own food-based business. Thus, the MarketReady program was created to Encourage and stimulate the creation and acceleration of businesses owned and operated by women, persons of color, the economically disadvantaged and others in need of a new career path. 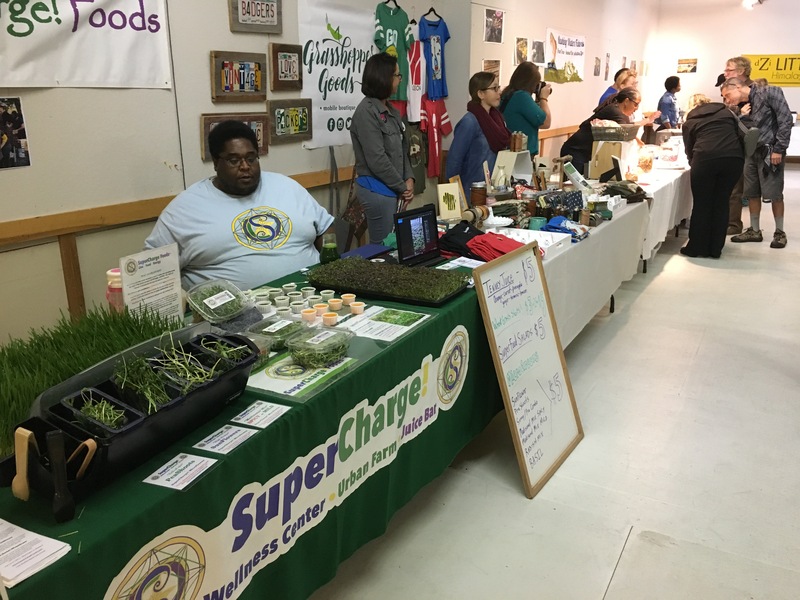 MarketReady is funded by the City of Madison and administered by the Northside Planning Council and FEED Kitchens, in partnership with the Wisconsin Women’s Business Initiative Corporation and Dane County UW Extension. They are actively working to provide training, supportive services and micro-grants for entrepreneurs interested in becoming Madison Public Market merchants. The primary objective is to provide business training and some initial capital to help prepare these new entrepreneurs for a successful launch in the Market in 2019. Thirty (30) businesses will receive direct assistance over a two year period to prepare them to sell at the market. Fifteen (15) will each receive $3,500 to help pay for initial business costs; five of those businesses will receive $13,000 to set up their market space in the Madison Public Market. What might this variety of vendors offer to the Market’s visitors? Prepared food from Laotian, Tibetan, Venezuelan, Indian, Cajun and other cultural traditions; clothing from Africa and Asia; handcrafted artwork and more. Watch for updates about the success of the MarketReady program in future blogs.